CarGurus has 1,269 nationwide IS 200t listings starting at $16,988. The Lexus IS 200t debuts with a turbo 4-cylinder and an 8-speed transmission to try to take on German stalwarts in the entry luxury sedan category. Lexus set a tough target for itself in taking on the likes of the A4, the 3 Series, and the C-Class, and in many ways it has succeeded. With a balanced chassis, competent suspension, and well-weighted steering setup, it’s only small complaints that hold the IS 200t back. Everyone is getting into the turbo 4-cylinder game, and Lexus has finally joined the pack. The 2.5-liter V6 in the old IS 250 was a tired lump, and the aging 6-speed transmission it was chained to didn’t help matters much. With a new 8-speed cog-swapper and a pumped-up version of the turbo four found in the NX crossover, the IS 200t launches with an assertive start to round out the Lexus sport lineup. Handling and chassis balance are very pleasant here, and in the F-Sport version they’re truly confidence-inspiring, if a bit jarring around broken pavement. Design is attractive and somewhat divisive outside, but a class standout inside, with small features like the analog clock displayed proudly on the dash quickly becoming a brand icon. Lexus sent me an IS 200t in “Redline” red, equipped with the F-Sport Package ($3,545). With a blind-spot monitor with rear cross-traffic alert ($600) and the navigation and audio package ($2,645), it was quite well-equipped, although I was disappointed to see charges for the cargo net ($65) and trunk mat ($105). Illuminated door sills ($425) look great, and with a $940 delivery fee, the total price came to $45,650, more than $8,000 higher than the base's MSRP. 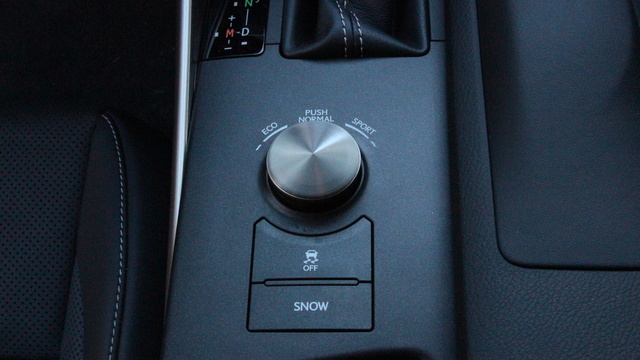 With all-wheel-drive (AWD) models in the IS and RC lineups still saddled with the old 6-speed, it’s rear-wheel drive’s time to shine with an extra 2 gears and a responsiveness that erases many of the painful memories owners have of the previous setup. Originally developed for the RC F, it’s easy to forget this is the world’s first 8-speed automatic, and it’s still a strong performer, with none of the reluctance I’ve experienced with the 6-speed. It handles the 241 hp and 258 lb-ft of torque from the 2.0-liter four quite nicely, especially at speed, and Lexus boasts the IS 200t is the first Lexus sedan to vary gear changes based on G forces, with this transmission downshifting during hard braking automatically and holding the lower gear through a turn until you’re ready to apply the power. It’s a nifty bit of tech that helps avoid the frantic hand-over-hand dance you often need to apply when cornering a paddle-shifter-equipped car. However, not all is right with the engine. There’s a bit of turbo lag from takeoff, beyond what I’ve experienced in rivals like the A4 and the 3 Series. It’s a small gripe here, but Lexus was pretty boastful about its twin-scroll turbo eliminating this problem, so it must be mentioned. However, if you’re not concerned with being the fastest off the line, the 2-liter performs well throughout the rest of the rev range. I’d even say it’s a quieter, smoother affair than the BMW 2.0-liter, a characteristic nearly as important as overall power in this segment. At any rate, expect 60 mph to arrive in just under 7 seconds. Steering and handling are the true standouts here with regard to performance, and the IS 200t offers confidence-inspiring balance and composure, even when the tires start to let go. It’s a predictable and manageable amount of slip that makes you feel as though you’re in control, rather than that you’ve just moved past your skill level. This is thanks largely to the F Sport’s stiffened suspension and staggered-width 18-inch wheels, although the ride can get a little rough when driving through the broken pavement of a city. The adaptive dampers that come in the IS 350’s F Sport package would be a welcome upgrade here, although it should be noted that the IS 200t thankfully doesn’t make use of the intake sound generator the IS 350 does. Nothing but natural sound here. 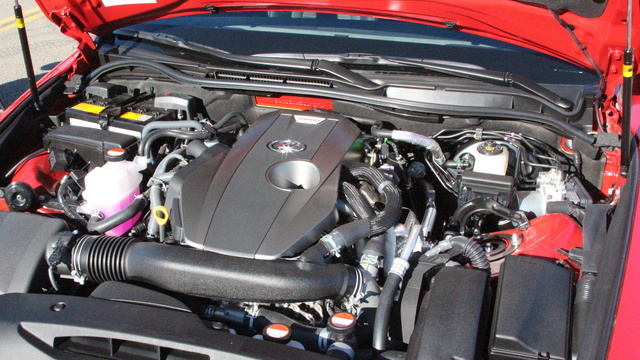 Fuel economy is EPA-rated at 22 mpg city/33 highway/26 combined. This puts the IS 200t just below the A4 and the C-Class, at 27 and 28 mpg combined, respectively. That's not enough to really make a difference at any rate, but both are quicker off the line, and the C-Class could be even quieter than the IS 200t. Regardless, I was easily able to meet and beat those figures, even with liberal use of the pedal on the right. Form has been the defining feature of Lexus offerings of late, often overshadowing function. The IS 200t is the most aggressively styled of all the compact luxury sedans, almost to the point of making the competition look a little dated. Whether you like the styling or not, it’s certainly memorable, and after we get a few years and miles down the road and more of those big woven grilles are lost to parking mishaps, we’ll look fondly back at the divisive styling of Lexus during this second decade of the 21st century. Personally, I like the look of the IS 200t. It approaches garishness without crossing the line, and the blending of the angles from the side skirts up into the rear light cluster is one of the most interesting bits of auto design out there right now. 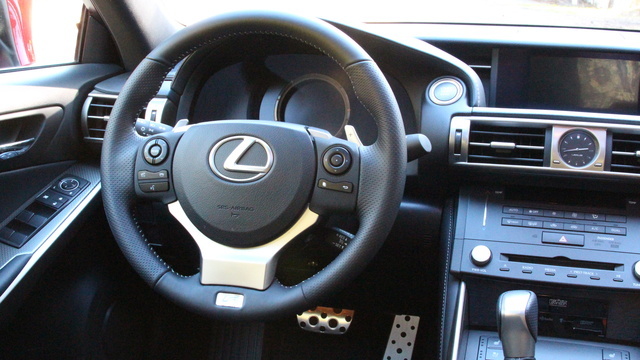 Inside, Lexus continues to set standards, as the interior of the IS 200t is one of the best in the class. It has high-quality materials and padding in all the most important places, but this only makes the remaining hard plastic even more of an eyesore. Things like the seatbelt adjuster and door pockets really stick out, and material upgrades in these last remaining plastic frontiers would do wonders for the overall experience. The Toyota Entune system is as simple and intuitive as ever, but here it's hampered by a remote-touch interface with a mouse-like controller that's just frustrating. The cursor just flies all over the screen with infuriating imprecision, and the voice controls aren’t much better. Even after going through the tutorial where the system is supposed to figure out your specific speech patterns for more accurate feedback, it has major trouble with numbered streets like “48th” and the like. Actually, I never got it to recognize certain streets, even after a half-dozen tries. More than that, some of the locations need updating, as more than once I attempted to find a restaurant or a car wash, and the system directed me to places where no such businesses were ever located. Things are quite comfortable front and back, with actual useable room in the rear for adults. 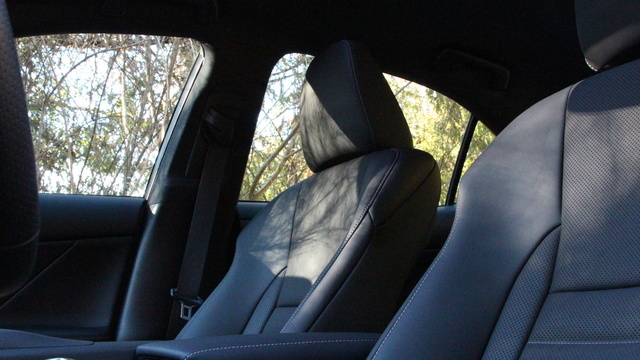 Some have criticized the F Sport seats for needing more support and bolstering, but I found them a nice compromise between support and comfort, even during spirited driving through California canyons and mountain roads. 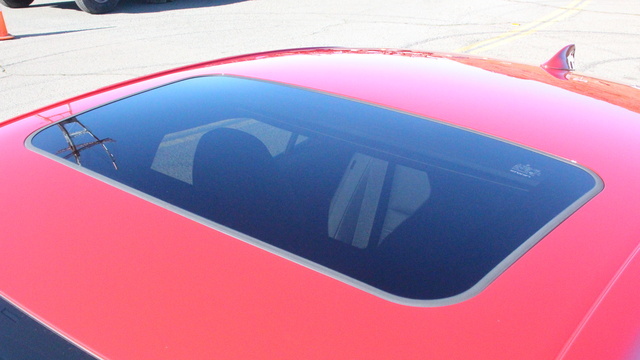 Specific for the F Sport Package are the addition of those sport seats, a black headliner, a perforated shift knob, F Sport badging, aluminum pedals, and some unique 5-spoke alloys wrapped in summer tires. Being a Lexus, there’s plenty of tech to go around, even in the base IS 200t. With standards like xenon headlights and LED running, fog, and tail lights, keyless entry and ignition, heated mirrors, and 8-way power front seats, it's already well-equipped. Start clicking those option boxes and you can be awash in all the technology you could want. For the F Sport package, that means LED headlights, drive-mode select, Lexus’ Enform Safety Connect system, and upgrading to a 10-way power driver’s seat with 2-way lumbar control, as well as heat and ventilation for the front seats. The upgraded Entune system means real-time traffic and weather, and the Navigation Package adds a Mark Levinson 5.1, 17-speaker sound system pumping out 835 watts, plus an electrochromic auto-dimming rear-view mirror. And let’s not forget the trick instrument cluster, which here moves to the right so you can show your turbo pressure, among other optional readings. It was definitely my preferred configuration, and it got annoying to have to move it over to the right again every time I started the car. One of the biggest, and perhaps least publicized, upgrades for the IS 200t as compared to the outgoing IS 250 is the brakes, which get redesigned, vented rotors front and back as well as upgraded pads for the F Sport version. There have been no official tests released for stopping distances, but an IS 350 will stop from 60 mph in around 123 feet, which is average for the segment. The IS 200t has a very similar weight to its bigger brother, but as it’s slightly lighter and with the larger summer tires on the F Sport, you can expect an improvement there. ABS is of course standard, supplemented with electronic brakeforce distribution and brake assist. The IS 200t comes with 10 airbags and the previously mentioned Enform Safety Connect, which will automatically alert authorities in the case of an accident or theft. The National Highway Traffic Safety Administration has awarded the IS series an overall 5-star rating, which the IS 200t earned in all tests excepting a 4-star rating in frontal crashes, while the Insurance Institute for Highway safety awarded its highest rating of Good. 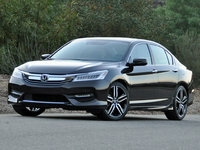 Because of the convoluted configuration of the different options packages between manufacturers, it’s easy to be fooled with regard to which entry-level luxury sedan is the best value. A C-Class Mercedes is a better car that has a higher base MSRP and some standard features that come only with the $3,545 F Sport Package for the IS 200t. However, to equip both vehicles equally, you’re going to break the $50K-mark in the Mercedes, or come quite close. Do the same exercise with the 3 Series and you’ll end up with a few extra options and still have more than $1,000 in your pocket. Plus, you can have it with a manual transmission. But the point is, we’re actually having this conversation and running these numbers, rather than just offering the easy out that “It’s not a 3 Series” and calling it a day. Lexus is creeping up on the competition and has offered a package that's a viable alternative. The sales prove it, as it’s currently sitting comfortably behind the 3 Series for 2016. Whether it’s the right ride for you will largely depend on whether you prefer style or outright performance. Thankfully, there’s a poison for each preference. With the Jaguar XE coming out this year, and Cadillac finally offering a suitable alternative, the competition is getting fiercer than ever. What we can say is that Lexus vehicles tend to hold value quite well, and while reliability is difficult to estimate with a new car, if it maintains the bar set by the outgoing IS 250, this shouldn't be a concern either. Further, there is a current standing offer to military personnel and recent college graduates of $1,000 toward the purchase or leasing of an IS 200t, in effect at least through 2016. 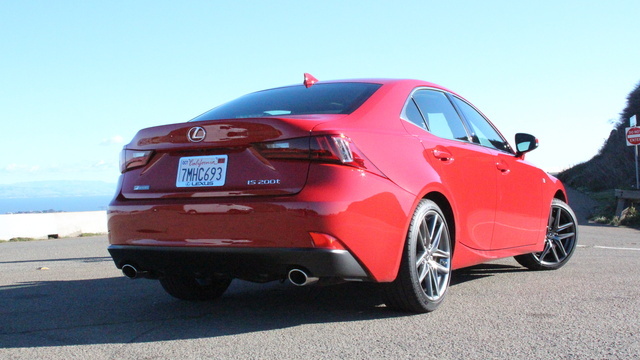 What's your take on the 2016 Lexus IS 200t? Users ranked 2016 Lexus IS 200t against other cars which they drove/owned. Each ranking was based on 9 categories. Here is the summary of top rankings. 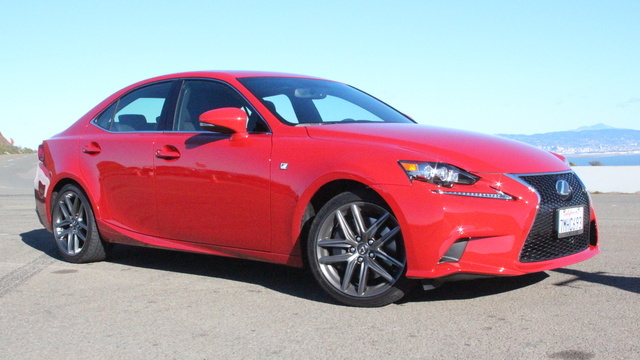 Have you driven a 2016 Lexus IS 200t?